Distinguished presidential historian Michael Genovese explains what it takes to be a good president, and he says Donald Trump would not be an effective one. Voting analyst Daniel McGraw says there is a death gap between the two parties, with many more Republican voters checking out than Democrats. And sociologist Andrew Cherlin says only people with decent combined incomes are getting married these days. August 23, 2015 Prominent historian Michael Genovese on why Trump would be a terrible president … voting expert Daniel McGraw says Republican voters are dying faster than Democrats … and sociologist Andrew Cherlin links marriage to income. Michael Genovese One of America’s most distinguished historians, Michael Genovese, describes the powers and limitations of the presidency … and says Donald Trump would find that barking orders is not going to work. 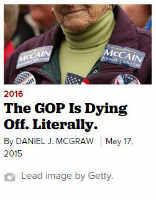 Daniel McGraw Journalist and voting expert Daniel McGraw says Republicans have an actuarial problem because so many of their voters are older than Democrats. But, he warns, if the Republicans concentrate on economic issues, they may get younger voters to listen to them. Andrew Cherlin Sociologist Andrew Cherlin says there is a marriage gap, with only those couples with the prospect of decent incomes actually legalizing their union. Jim Hightower Government of, by, and for Big Money. At this patriotic time of year, celebrating Memorial Day, journalist David Shipler says President Obama’s campaign against whistleblowing reminds him of covering Cold War Russia. Sociology professor Andrew Cherlin , at this time of graduations and weddings, notes that the growing economic disparity is having a negative effect on higher education and marriage rates. And Congressman Dan Kildee takes on the president over trade in an interview on the Bill Press show. May 5, 2015 First amendment expert David Shipler says covering Washington is like covering Cold War Russia … sociology professor Andrew Cherlin ties a drop in college graduation and marriage to the growing income gap … and Congressman Dan Kildee assails the president on trade in a Bill Press Show interview. David Shipler Barack Obama promised to be the most transparent president, but journalist David Shipler writes that this liberal constitutional lawyer has made covering national security like trying to cover Moscow during the Cold War. Andrew Cherlin Sociology professor Andrew Cherlin says that family life is shrinking along with the middle class because young people can’t afford to get married and devote time to children. Dan Kildee Congressman Dan Kildee assails the president on trade in a Bill Press Show interview. Jim Hightower Big Food trying a big hoax.